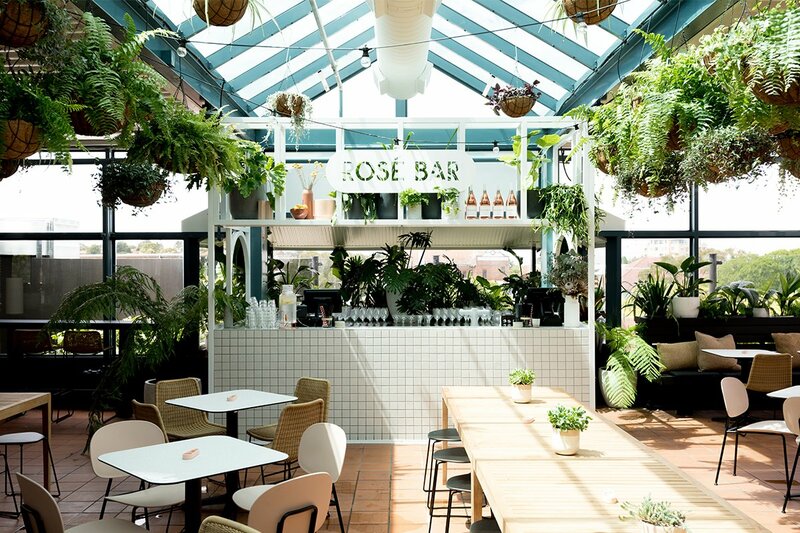 TO CREATE ‘SYDNEY’S BEST ROOFTOP BAR’, WITH A DESIGN THAT LEVERAGED AND ENHANCED THE SITE’S OCEAN AND HARBOUR VIEWS, WITHOUT WHOLLY RELYING ON THEM. WHAT DOES IT TAKE TO LURE THE CROWDS FROM THEIR CBD PERCHES AND INTO THE WILDS OF MOSMAN? A MEMORABLE EXPERIENCE THAT TRANSFORMS AN OUT-OF-THE-WAY MID-CENTURY BUILD INTO A DESTINATIONAL VENUE. AT THE FERNERY, WE POLISHED A DIAMOND IN THE ROUGH, TURNING OUT A GEM OF A SPACE THAT CHANNELS A 70S-ESQUE GREENHOUSE AESTHETIC WITH A SPLASH OF HIGHBROW CHARM. WE HONOURED EXISTING ELEMENTS, INCORPORATING TEAL AND TERRACOTTA TONES TO PUNCTUATE THE CRISP, WHITE TEXTURES THROUGHOUT. IT’S A REPRIEVE FROM URBAN LIFE; A PLACE OF ELEGANT GREENERY AND UNABASHED DECADENCE.